Pu-Erh tea can be traced back to the Eastern Han Dynasty (206 BC–220 AD). Pu-Erh tea was traditionally made with leaves from old wild tea trees of Camellia sinensis assamica plants, which grow in southwest China as well as the bordering tropical regions in Burma, Vietnam, Laos, and India. Camellia sinensis assamica leaves are noticeably different from their sister plant Camellia sinensis sinensis in chemical composition; therefore changing the taste and odour of the steeped tea and making it more appealing for the aging process of Pu-Erh. Because of the rarity of old wild tea trees, this Pu-Erh is usually “diluted” with tea from the mountains of Yunnan. The majority of this single source Pu-Erh is sold in the Hong Kong market to tea connoisseurs who seek Pu-Erh with leaves taken from only a single tea mountain's wild forests and they are willing to pay the high prices for a very good product. This Pu-Erh is quite a bit stronger than most of what reaches the North American market and may command up to $10,000 for a single kilogram. Most of the Pu-Erh that reaches North America is milder and may be from either Yunnan or Guangdong Province for the most part. The Yunnan variety is thought to be the better and there is rivalry between the two provinces for the right to call this tea ‘Pu-Erh’. DISTINCTLY TEA carries tea from both Yunnan & Guangdong provinces. Pu-Erh comes AGED (black) or RAW (green) and has a stronger taste than either black or green teas. It is the only tea that is ‘fermented’ and aged for extended periods of time, some expensive varieties as long as 50 years. The aging process and its ability to store for long periods of time make this a tea comparable to a fine wine that just gets better with age. If stored properly, away from moisture and strong odours, (not in plastic) it will keep very well. Pu-Erh is known to aid digestion after a greasy meal, help warm the stomach, help produce saliva and dispel the effects of alcohol. It is also reported to lower cholesterol and triglycerides in the blood stream. Other benefits of Pu-Erh are its long-standing use as a beauty tea helping with weight loss and known as a slimming tea. Many infusions (steepings) may be taken from Pu-Erh with the first one timed at 2—3 minutes and subsequent ones being much shorter. There is less caffeine in Pu-Erhs and it is an excellent evening meal tea because of this. The taste of a plain Pu-erh is lovingly called ’barnyard’ and is not for everyone. 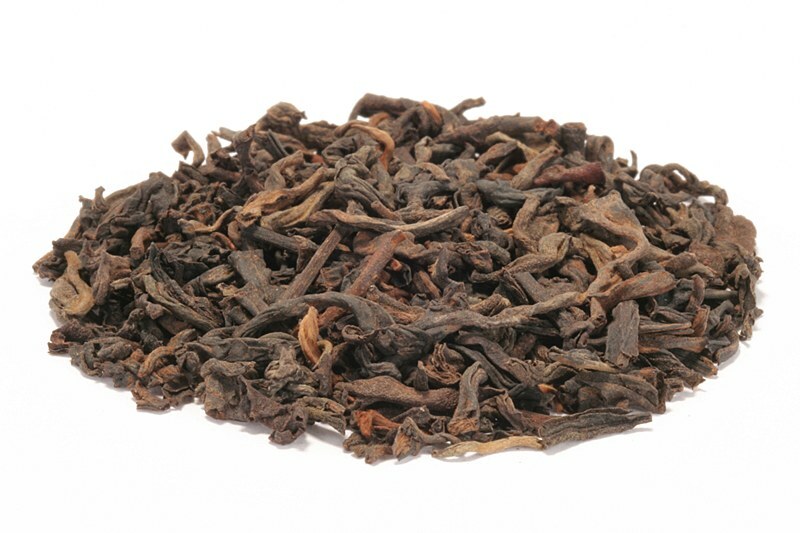 The taste for most North Americans is an acquired one and we recommend a good quality Pu-Erh. We carry several excellent qualities, all of them varying in taste. We have added a few flavoured Pu-erhs which are a good place to start if you are new to this type of tea. As our slogan says, why not make this tea ‘a part of your healthy lifestyle’.